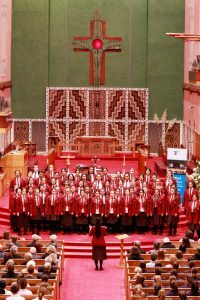 A cold winter morning brought 35 choirs together on Tuesday 29 May for the East Coast Big Sing Regionals at Napier’s Waiapu Cathedral. Choirs worked to showcase their harmonies, movement and diction. Sacred Heart Napier had three choirs in the competition. Pictured is Year 13 student Henga Ofa with the SHC Gospel Choir, which she has put through their paces this year and directed. The choir has hit record numbers with 65 students joining in song together. The performance showcased the sisterhood amongst students. Their standout piece was Henga’s arrangement of Imela, a South African work translating to: ‘Thank you, Thank you, My King’. Rachel Carson is TIC Music and Teacher of Religious Studies, Sacred Heart College, Napier.